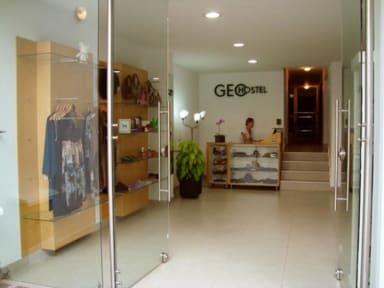 Geo Hostel is not only an inexpensive alternative for you to stay at, but it is also a space that stands out for having a unique environment amongst the hostels in the city. Geo Hostel is a completely new place which counts with 8 rooms ( 3 private and 5 shared, all with a private bathroom), a recreational area and kitchen with all the necessary facilities for the use of our guests. A very nice and quiet hostel which is perfectly located. We stayed in the 8 bed dorm which we really liked minus that some nights it got hot if you did not turn the fan on. The only downfall was the washroom itself in the dorm was not always that clean and we kept using the other many washrooms around the hostel. The staff was awesome and the location could not have been any better. Your obviously staying in the busy tourist town so be ready for a bit of noise sleeping but just put some ear plugs in and your fine. Would highly recommend this stay! Overall we enjoyed our stay here, the staff was very helpful & polite. We stayed in a private room and it was just like a hotel. 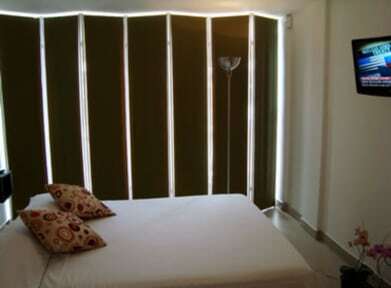 This is the perfect location to stay in Poblado! A general note, we did select this hostel for a few amenities that were not available including: air conditioning in the room ( it was just an extremely noisy box that made some cold air but never cooled the room) and there were no Laundry Facilities, but luckily the staff directed us to a laundry service down the block. Excellent location, but staff a little odd. To begin, they altered shifts daily so we couldn’t quite befriend anyone who worked there. Furthermore, when a new member of staff would arrive they would lay down the rules of the hostel in an aggressive manner. This inconsistent schedule and bizarre dimeaner became amusing more than intrusive. To conclude, guests should probably feel like they are being taken care of in a hostel and not at their godparents house, feeling grateful to have a home. Actually very clean for a hostel and cleaners did a good job keeping the room and bathroom clean on a daily basis. Staff were fine. Room got v loud on Friday and Saturday night as its so close to bars and clubs though. Hard to sleep. Having said that the location was amazing! So close to great restaurants and easy for us to get food or go for drinks. Great value for what we paid! If you a want a party hostel it’s NOT the place. Staff was annoyed by bring anyone at anytime to the hostel. Good location. The best part of our stay was the hostels coordination in getting a taxi to pick us up from the airport. We found the staff to be unfriendly and unhelpful. They seemed irritated to have to answer simple questions like, do you have a map of the area or where would you recommend for dinner. The person helping with the breakfast was also rude. The room was simple, but the sheets didn't seem very clean. Perhaps that's what you can expect for under $40 USD per night.